and neither can K. or I. The Cemetery is part of a longer piece by Peter Burzynski entitled The Cemetery Sideshow and first appeared on Between the Essence and the Descent. I received it on October 21, 2011 at the Academy of American Poets Awards Ceremony in New York City. 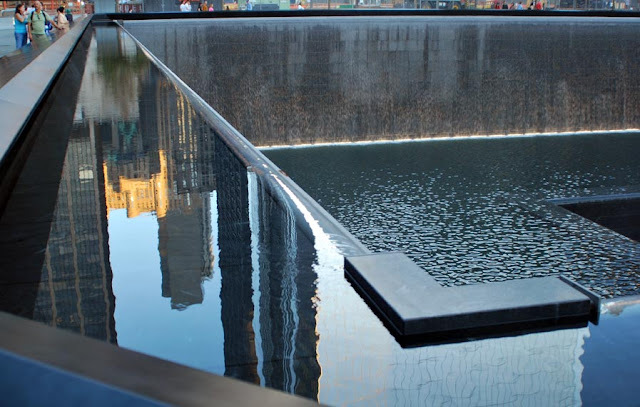 Visit Between the Essence and the Descent to learn why a photo of the 9-11 Memorial accompanies this piece, the story behind the poem, and a video of Peter reading the poem in three parts. Peter, it is my pleasure and you are welcome. Keep forming your voice, I like what you are writing. You will have to let me know about the poets' costume party if I do not attend. Really fine poem. Leaping, steady, deep. Spread the word, Michael. Feel free to share upon these pages.